The success of every business organization largely depends on the company’s productivity, which is directly influenced by the quality of labor. The vital aspect of recruitment is choosing the ‘Right Man for the Right Job’. Thus it is essential for every organization to lay emphasis on efficient recruitment. Recruitment Process Outsourcing in a way helps an organization focus on its core functions, giving some respite from the time consuming task of recruiting. Recruitment process outsourcing (RPO) is a form of business process outsourcing (BPO) where an employer outsources or transfers all or part of its recruitment activities to an external service provider. A recruitment specialist/provider acts as a company’s internal recruitment function for a portion or all of its jobs. 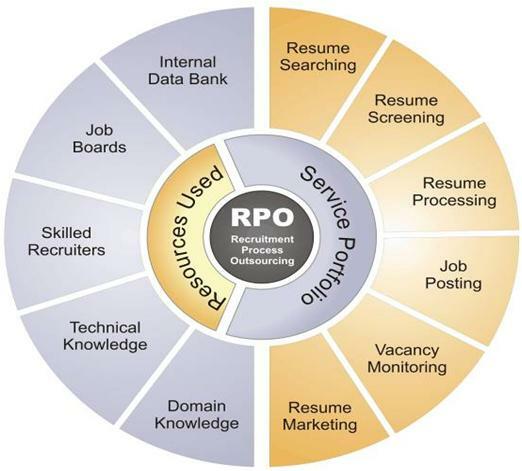 RPO providers manage the entire recruiting/ hiring process from job profiling through the on boarding of the new hire, including staff, technology, and method and reporting. A properly managed RPO will improve a company’s time to hire, increase the quality of candidate pool, provide verifiable metrics, and reduce cost and improve governmental compliance. Saves Time: Recruitment is a time consuming process of attracting, screening, selecting and on boarding a qualified person for a job. RPO can help the smallest organizations with no facilities to recruit and the largest organizations that need the services of recruitment specialists, saving Time. Cost Effective: RPO’s help an organization reduce overhead costs from their budgets and improve a company’s advantage in labor. Best Candidates: The strategies adopted by an RPO for sourcing can benefit an organization with the most suitable and best candidates. By advertising on various job boards and social media sites they promise to fetch, the best from the rest. Talent Acquisition: Talent acquisition is the targeted recruitment of high performing teams into a company from a competitor or similar type of organization. A recruitment specialist can identify approach and recruit top performing teams from competitors, benefiting an organization. However recruitment process outsourcing can be an expensive affair when it comes to hiring hard- to- find technical specialists. Thus many organizations prefer outsourcing only those portions that they have the greatest difficulty with and that add the greatest value to them. A low cost recruitment service is the only solution that can optimally benefit an organization.